Congresswoman-Elect Alexandria Ocasio Cortez (D-NY 14th), a 29 year old Democrat Socialist who hails from The Bronx, New York, won her general election with 78% of the vote. Yet her initial comments either indicated an unpreparedness for victory or a pose to propagandize her brand. Due to the demographics of the district, it was virtually fait accompli that Ocasio Cortez would win in November after surprising House Democrat stalwart Rep. Joe Crowley (D-NY 14th) by 15% in the June 2018 New York primaries. 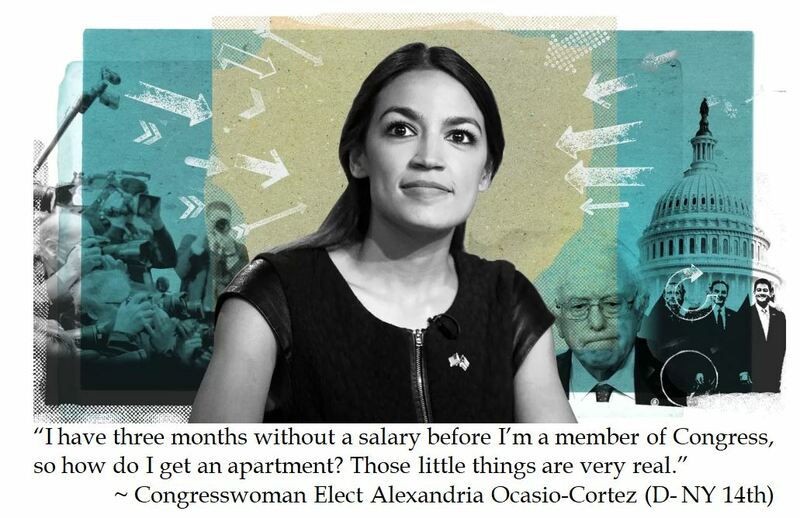 Yet after she won, Ocasio Cortez publicly complained that she would not have income for three months, so it would be initially dicey for her to find digs in DC prior to her "inauguration" (sic). So an economics major from Boston University from Boston University could not budget enough buffer for a sure thing victory in order to have a place to stay in the District of Calamity prior to pulling her first paycheck Sure. Detractors of the rising Democrat Socialist star have derided her as Occasional Cortez, who they believe is not bright nor schooled in the political process. However, the wording of her "too broke to move" sob story hint that it is contrived political posturing. Ocasio Cortez comes from the Bernie Sanders wing of the Democrat Party (despite the fact that Sanders actually is no longer a member of the party). Aside from her chops of being a community organizer, Ocasio Cortez tries to conjure the mien of being considered a working class hero. What better way to identify with voters who live paycheck to paycheck to play up this wage gap before taking office? This would not be the first time that Ocasio Cortez has played fast and loose with her bio to identify with the downtrodden. Ocasio Cortez played up her roots in the Bronx, even after it became evident that she grew up living with her architect father in well to do Westchester County while commuting to school in the Bronx. If Ocasio Cortez truly cannot afford an apartment before she is "viviendo del mamey" (Boricuan slang for living off the state budget, or living the easy life), she could follow the example of outgoing House Speaker Paul Ryan, who slept in his office. Surely the DNC has a room that they can set aside for the newly elected working class leader. Just make sure that you pay the average daily rate for lodging lest you get hounded and forced to resign like former Trump Energy Secretary Scott Pruitt. Check that, ethics rules usually only apply for Republicans. Ocasio Cortez's post election kerfluffle may hint at trouble for Democrats organizing in Washington. It would seem that Ocasio Cortez is not content to be a back bencher while learning the ropes on Capitol Hill. It seems that there are three contending factions in the Democrat Caucus: The old school, like presumed Speaker Rep. Nancy Pelosi (D-CA 12th) and current Democrat Whip Rep. Steny Hoyer (D-MD 5th), who are established Democrats who are eager to regain their powerful positions. While it is a relatively small faction, there are moderates like Rep. Tim Ryan (D-OH 13th), who seem like vestigial Democrats of old who champion patriotic union working class voters. Their clout may be somewhat bolstered by the fact that many of the newly elected Democrats won because of their moderate credentials. Then there are the Young Turks, like Ocasio Cortez, who want the revolution now. Losing Democrat Senator Claire McCaskill (D-MO), labeled them the crazies. These rabble rousers will not wait their turn for power. They may chaff at having their leadership being comprised of septuagenarian establishment types who want to protect their positions rather than upturning the system. The question is how the (Democrat) Congressional Black Caucus will side in the leadership battle. On the one hand, the CBC has paid their dues and followed a strategy of rising to ranking member status by hanging onto office forever (save ex Rep. John Conyers, who was chased out of office in late 2017 after fifty years because of sexual harassment allegations). Congresswoman "Auntie Maxie" Waters (D-CA 43rd) is in line to be the Chair of the Financial Services Committee, so she has strong motivations to line up with the establishment. But Waters also was a driving force during the Midterms to chant "Impeach 45". Ms. Pelosi was trying to tamp down those voices during the campaign. If House Democrats intend to govern, leadership may strive to quash those sentiments, which could cause resentment and a change of alliance. In the last 115th Congress, the CBC felt slighted in leadership. House Democrats made up a faux leadership position for Rep. James Clyburn (D-SC 6th) as "Assistant Democrat Leader", but who had a title but little clout. It is unclear if that will be enough for the CBC now that they are back at the helm in the House. Fourth term incumbent Hakeem Jeffries (D-NY 8th) is vying to succeed Joe Crowley for the number four position in the Democrat Caucus as Caucus Chair. This might split the CBC as Jeffries competitor includes entrenched left coast progressive CBC member Rep. Barbara Lee (D-CA 13th). Next week, Democrats will return to the Capitol City and organize their caucus. Either Ocasio Cortez will have to couch surf or get a cash advance to participate.